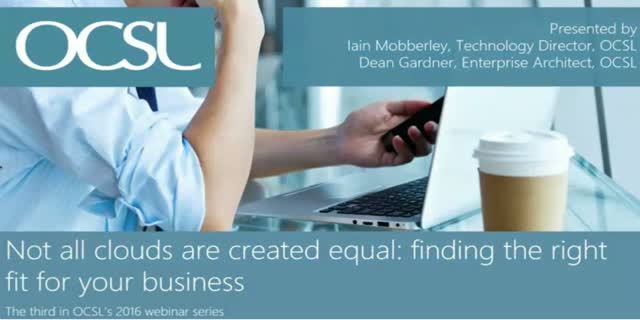 Do you want a fresh perspective on the world of IT and how it can help your business? We'll help you think without limitation to get a better answer. Our experts will look at current and future business challenges and opportunities. What do they mean to your business? How can they help drive efficiencies and deliver transformation? Which are the ones to pursue and which to avoid, and why? Everyone’s heard of Cloud technology. But what does this overused term actually mean in reality for businesses today? And for the future? How is it really solving business problems and challenges? In reality ‘moving to the Cloud’ isn’t really about adopting a new technology, its about changing your business. But how does this impact your IT team? What does it drive in terms of change both within the IT function and across the wider business? This is not about traditional ‘lift and shift’: it’s about transforming businesses, moving from a server centric to a service centric approach. The IT function needs to define its service catalogue: what do you offer, how do you deliver your services, what is enabled via the cloud. Attend our 30 minute webinar to gain insight into the steps you will need to take and what you and your business will need to think about to achieve this business transformation. All based on real-life customers examples. Both of our presenters have a wealth of experience in understanding customer’s business needs, then identifying solutions that will ensure these needs are met both today and into the future. Cloud-based Technology Trends: How will they impact your business? In OCSL’s latest Webinar our technology experts, Mark and Olly, take you on a lightning-quick tour of the latest cloud-based technology trends. In just over 20 minutes, get an up-to-date overview and inspirational ideas from our bite-sized case studies.